Coin-operated strength-testing amusement devices have always had a particular allure for me. 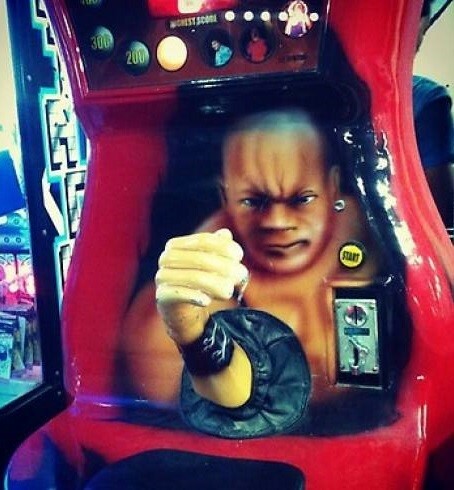 Whenever I come across one at an arcade or a fair, I still feel compelled to try it out to prove to myself, and to anyone else who may be watching, that I’m sick strong. I always hope to reach the “He-Man”, “Gorilla”, or “Superman” level, but realize that depending on the machine’s setting, a less impressive result like “Loverboy” is a possibility. You belong in a zoo. Due to the simplicity of the Golden Arm’s design, it’s not unusual to see refurbished versions with customized artwork. 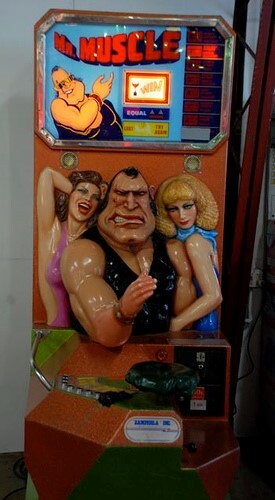 My personal favourite armwrestling machine—and the one I’ve competed against the most times—is the Mr. Muscle machine. Most of these were manufactured in the ‘80s by Zamperla, an Italian amusement device company. There were two types of Mr. 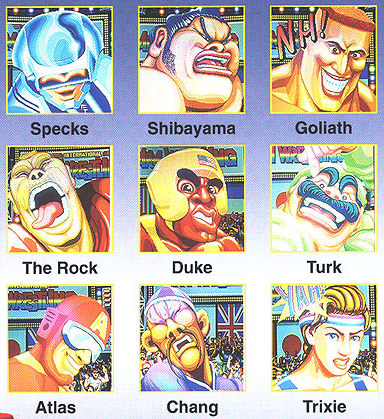 Muscle machines: those that featured four strength levels, and those that featured eight strength levels. The look of the machines was always very similar, with a huge-armed tough-looking guy flanked by two cheering women. However, minor tweaks to the appearances of these characters were common. There were also marquee variations. When competing against Mr. Muscle, the player first chooses the desired strength level and then tries to pull Mr. Muscle’s arm down within a set period of time. Three outcomes are possible: a win, a loss, or a draw. Within these outcomes, there are result sub-categories, depending on where the mechanical arm is positioned when the time elapses. 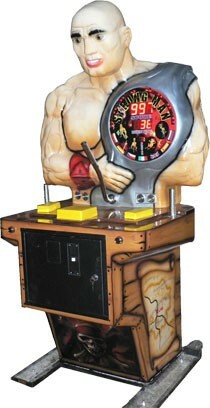 Mr. Muscle’s arm is powered by hydraulics, and the difficulty setting can be adjusted. I once played an 8-level version where just the fourth level seemed near impossible. 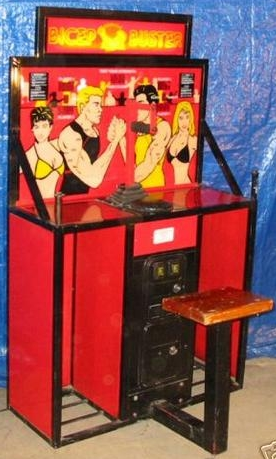 Another armwrestling machine which is seldom seen is The Grappler, introduced by Canadian manufacturer Gametek Systems in 1988. From afar, The Grappler resembles a pinball machine with a lever sticking out of it. 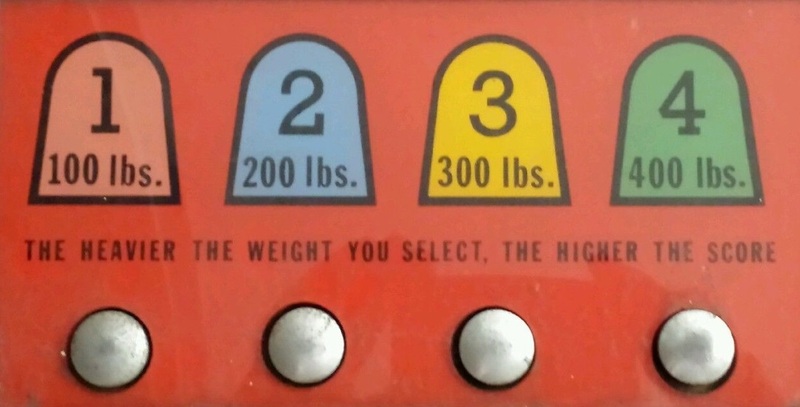 To test his strength, the player first selects a weight class. He then places the elbow of his competing arm on one of the circular cups and grasps the lever. He grabs a peg with his non-competing hand. He then tries to lower the lever using side-pressure. As with most other machines, there is a time limit. The Grappler is different from most other armwrestling devices in that it can be used by either arm (to the delight of lefties). 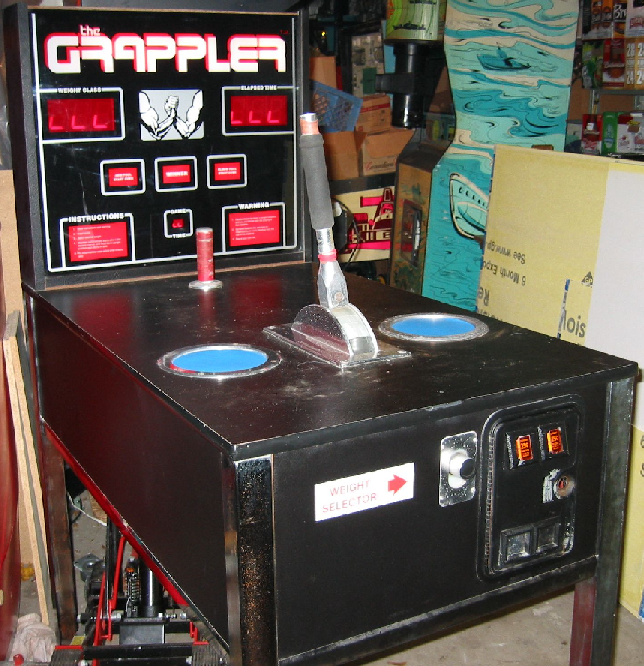 The Grappler was only produced for a short amount of time. Gametek Systems was actually listed on the Vancouver Stock Exchange in late 1987 and the company was projecting $60 million in after-tax profits within three years (perhaps banking on armwrestling being elevated in the public conscience following the release of Over the Top in movie theatres earlier that year). The stock soared, but came crashing down once it became public knowledge that the company had failed to disclose the fact it had been sued by a) the inventor of the machine and by b) two men who broke their arms when using it! The stock was soon de-listed. 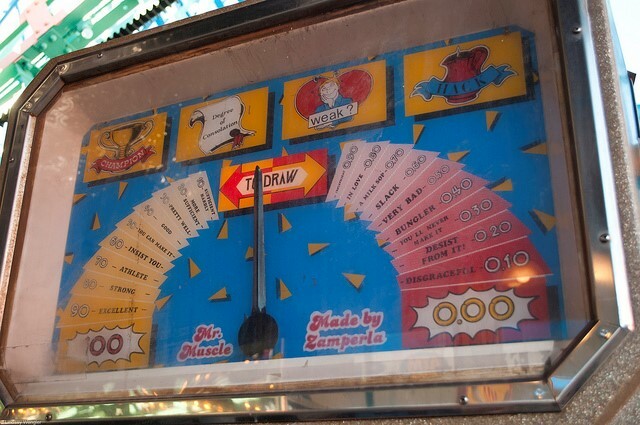 Like most armwrestling machines, the principle of the game is quite simple. You simply select one of six weight classes (fly, bantam, light, welter, middle, heavy) and then try to pin the arm down. You can try up to three times, changing the weight class in between bouts if you wish. 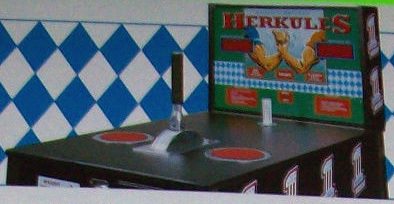 Arm Champs, manufactured by Japanese firm Jaleco in 1998, was the first strength testing armwrestling machine to feature a video game opponent. One of five different opponents of progressive strength can be selected: women’s champion and British professional wrestler Nessie Papillon (1), an unemployed German (2), Chinese fisherman Choyonpin (3), a South African miner named Mike Robinson (4), and American truck driver Wolf Adams (5).The game offers two types of play—tournament mode where you keep pulling progressively difficult opponents until you lose, or regular mode where you select your opponent in advance. You have three attempts in regular mode, and can change opponents between matches. 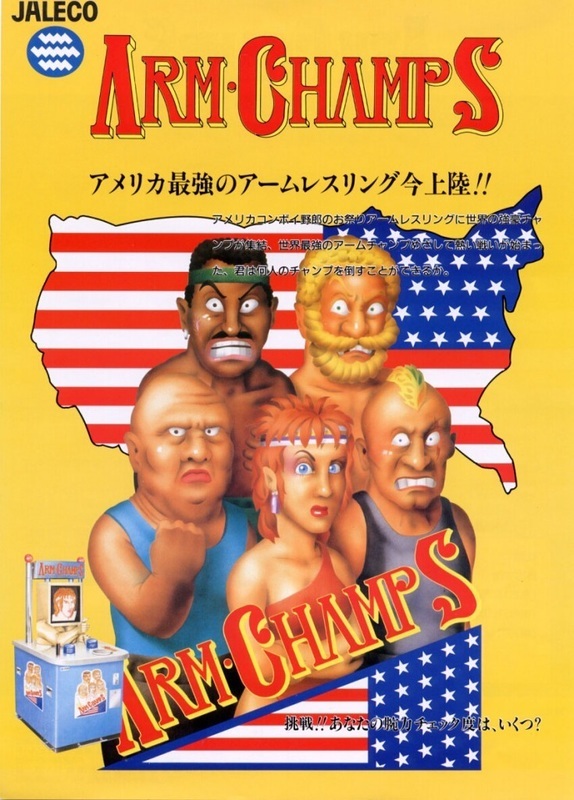 Arm Champs is thought to have only been distributed in Japan. There are actually four different versions of Specks, each progressively stronger, with the red version being the strongest. 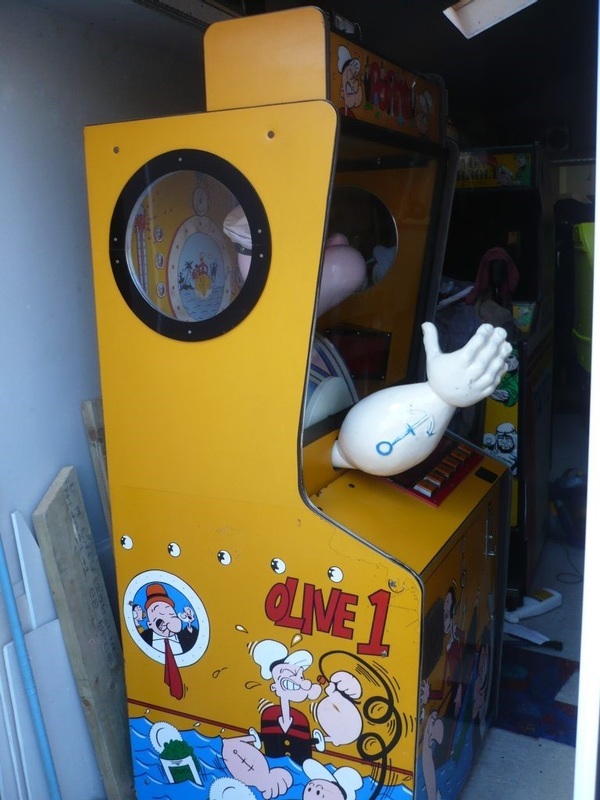 At the end of regular play, there is a bonus stage where the player’s strength is measured in pounds of pressure exerted against the arm. When the game was first released, reports of broken arms soon surfaced. Over a two-week span, five teenagers broke their arms playing the game in Hong Kong. Apparently, there was a sign indicating that players played at their own risk. Unfortunately, the signs were in English and they only spoke Chinese! 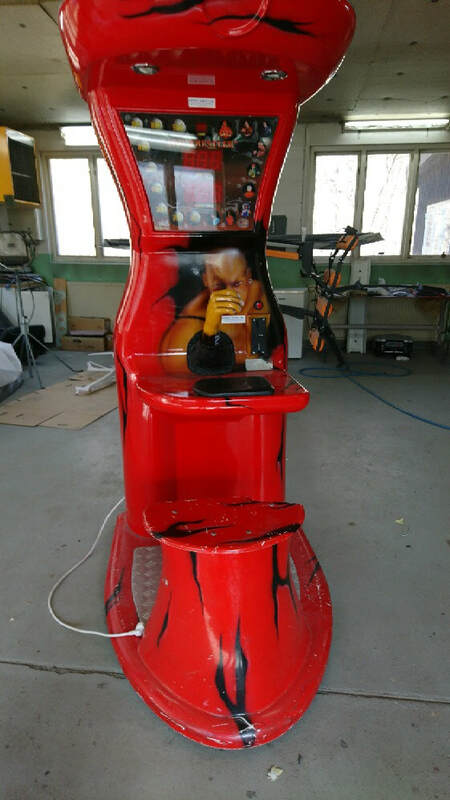 A couple of Polish game manufacturers introduced armwrestling machines in the past few years. Arm Wrestler is made by Jakar. To play the game, one sits on a tree stamp and grips up against an odd-looking fellow who has a big upper arm, but a puny lower arm by comparison. There are three different strength levels, and the machine features various funny sounds and messages that taunt the player. The machine comes in a few different versions. Strong Man is another Polish game that was first introduced by X-Line Ltd. in 2007. In this game, the player puts his elbow on a pad, grasps a lever (rather than an arm), and attempts to pull it down as hard as possible. The game allows for both left and right hand play. The large, muscular figure holds what appears to be a championship belt over his shoulder, on which the player’s score is projected. The machine comes in two versions: one with a white man and one with a black man. The base of the machine can be fully customized to feature any art the buyer of the machine wants. 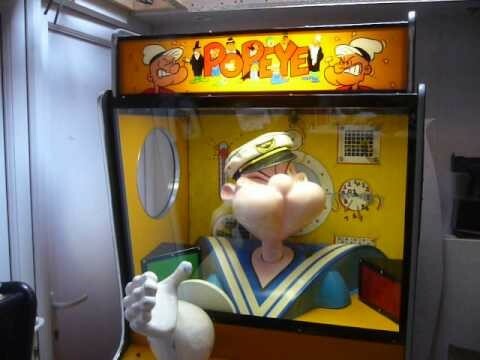 The game was distributed to 150 arcades across Japan before it was recalled less than one month later due to reports of three players breaking their arms when using the machine. Following the incidents, an Atlus spokeswoman said "The machine isn't that strong, much less so than a muscular man. Even women should be able to beat it," in effect adding insult to injury to the three poor young men! One of the most recent armwrestling machines to hit the market is Over the Top, made by South Korean firm Andamiro. It appears to be very similar in style and concept to Arm Spirit, with a mechanical arm, video screen, and variety of opponents. 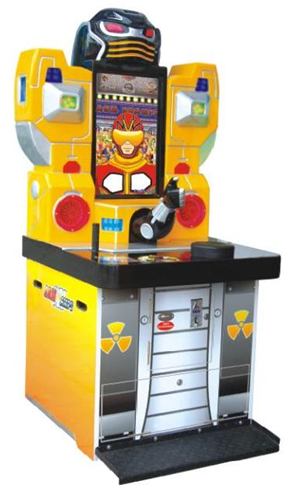 Yet another machine by the name of Arm Champs was recently developed by Chinese company I-Play. The machine has a futuristic look to it and a robotic-like arm is grasped rather than a human-like arm. Players can face off against two opponents before they then pull on the arm to record their maximum strength. 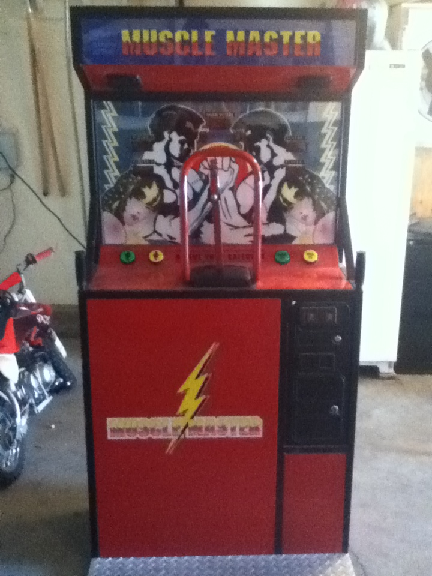 The machine looks very similar to Jaleco’s Arm Champs II. It makes me think that the two companies are somehow related. 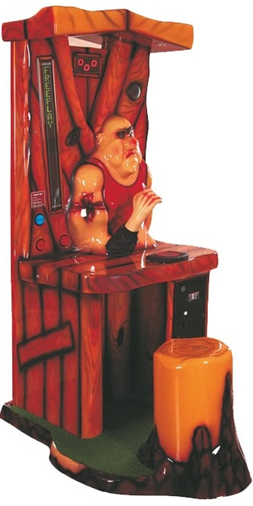 Other coin-operated armwrestling machines exist, as evidenced by the following pictures that I found online. Unfortunately, I have very little or no information about them. Bicep Buster appears to be a sit-down game where the player pulls on a bar. The machine can record up to four people at a time on the scoreboard. 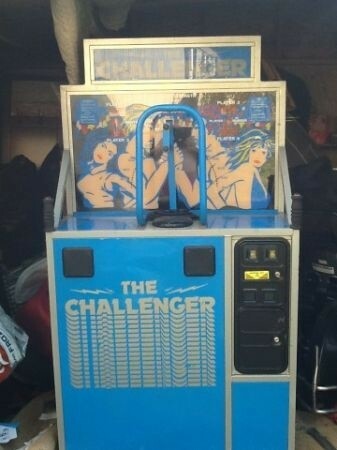 The Challenger and Muscle Master appear to be stand-up variations of Bicep Buster. I suspect they were probably made by the same company. The forearm does look a bit wimpy, sort of like the arm of the Polish “Arm Wrestler” machine. Maybe this is an older version? 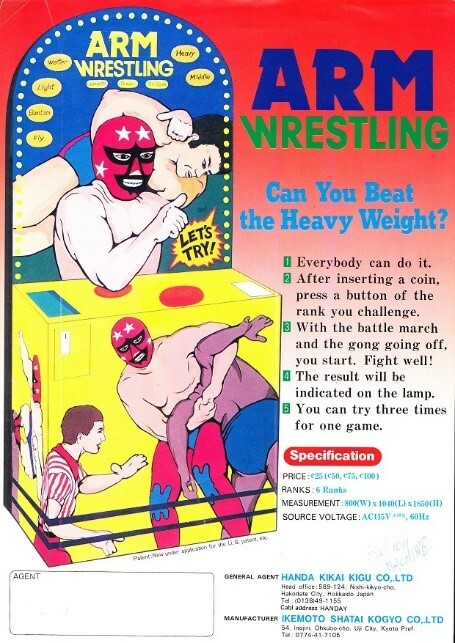 I’ve recently learned about another armwrestling amusement device. The “Strong Arm” was built by All-Tech Industries, a company out of Hialeah, Florida. 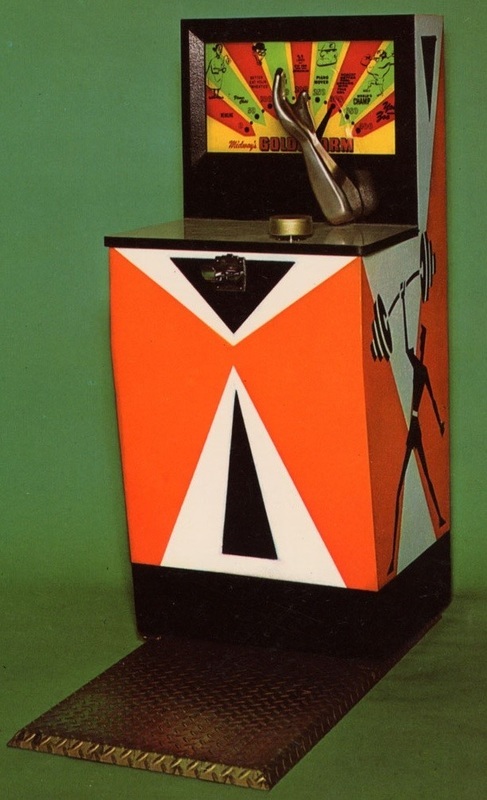 The machine was developed in the late ‘60s. Players had to hold onto the lever and resist its force. There were four strength levels from which to choose: the highest level could generate 400 lbs of pressure! ​It is indeed a machine that was made by Polish manufacturer LP System. 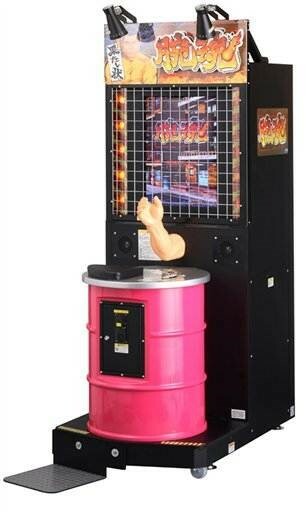 It appears to be called "Arm Wrestler". The year of production is unknown, but my guess is in the early 2000s. The machine simply measures how much you can press, and has some funny features. For instance, it laughs at you if you have a poor result. It also compares your result with various celebrities. If you are very strong, you are "Hulk Hogan". 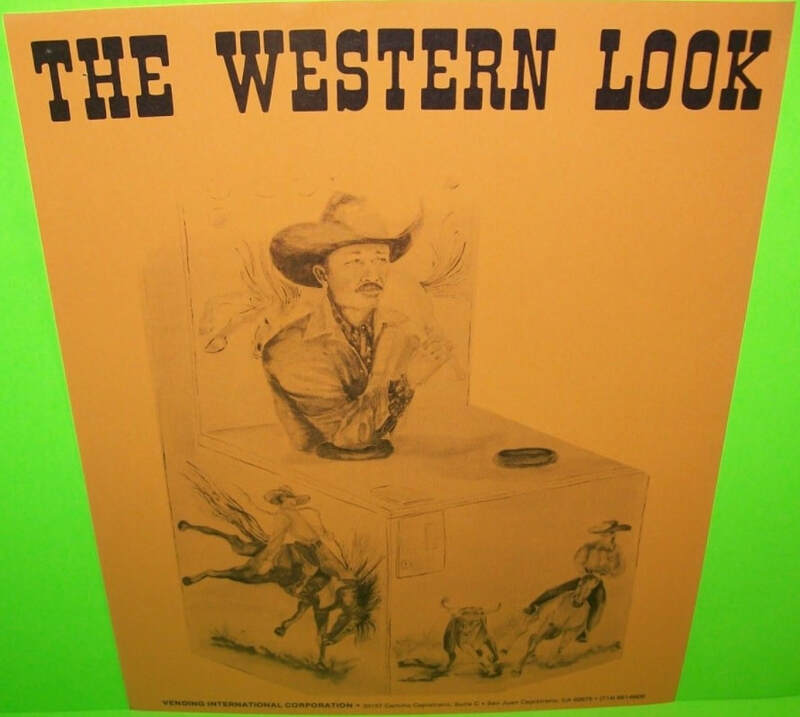 ​Another new discovery is a machine called "The Western Look". 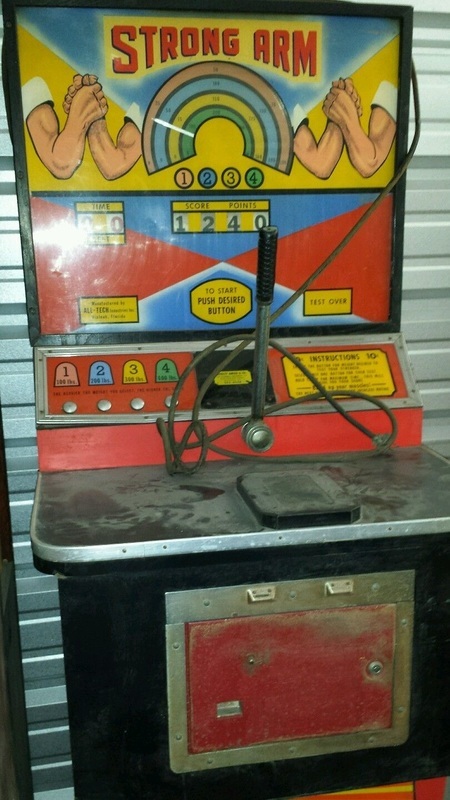 Very few details are known about this machine, including whether or not it actually saw production. It was developed by Vending International Corporation, out of California. Based on the look, I expect it is from the '70s or early '80s. ​I hope you’ve enjoyed this look at the coin-operated armwrestling machines that have been made over the years. There are likely others of which I’m not aware. If you know of any, I’d love to learn about them!